Right now I am using Firefox as my default web browser. Whenever I click on a link meant for other browsers (such as an extension for Chrome or widget for Opera), I need to copy the link and paste it in the address bar of the relevant browser. Site developers go through the same time consuming ordeal: to check their site’s compatibility on each browser, they open each browser separately and enter their site’s URL in it. Fortunately if your default browser is Firefox, there is a tool for you which can be used to save us from the abovementioned lengthy process. This tool is called “Open With”. Once you have set the options like this, you will notice a new set of icons in the top right of your Firefox browsing window. This set of icons corresponds to all other installed web browsers. In the image above you can see icons for Chrome, Internet Explorer, and Opera (which are the non-Firefox browsers installed on my computer). If you are on a webpage that needs to be opened on any other web browser, simply click on one of these icons. 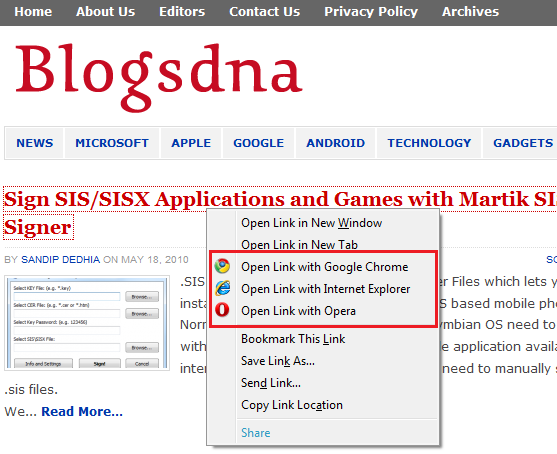 The respective browser will open the link of your current page. 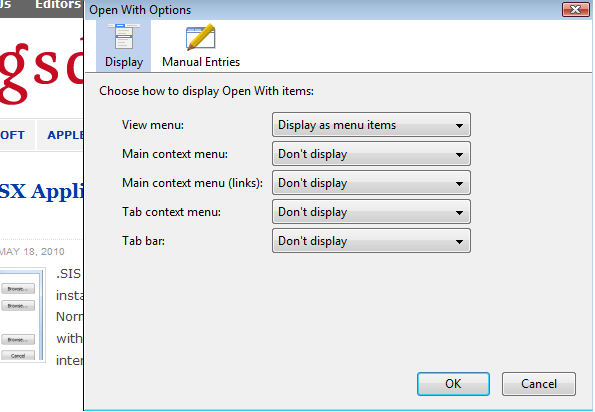 They way we set our options, we can also add an “Open With” entry to our Firefox context menu. Open With has definitely saved a lot of my time closing and reopening web browsers. I am sure it will be as helpful to you as it was to me.